We all know that Samsung permanently suspended the production of Galaxy Note 7 because of its explosive nature. Hence, Samsung decided now to brick all the remaining Galaxy Note 7s. Recently we have seen Samsung permanently suspended the production of Galaxy Note 7 because of its explosive nature. There are some serious problems in the factory battery anode and cathode cell contacts which cause the phones to explode. Not only that even we have also seen that Samsung also throwing up extra $100 to encourage people to turn in Samsung phones. Samsung had also launched a replacement program, to replace the existing Note 7 to the “Safe” ones, however, the so-called “Safe” units of Galaxy Note 7 also started catching fire. Looking after so many issues, the company permanently suspended the production of Galaxy Note 7 as we told earlier. It simply means that still, people are using the faulty Samsung Galaxy Note 7. For those users, the south Korean giant Samsung has just introduced the two-pronged plan. The first plan is to release a software update that will prevent the Samsung Galaxy Note 7 from charging beyond 60% this is to prevent overheating. But, hold on what if I say you all that if you are still carrying around a Samsung Galaxy Note 7 then you should return it as soon as possible? Now you all might be thinking that why I am saying this again right. 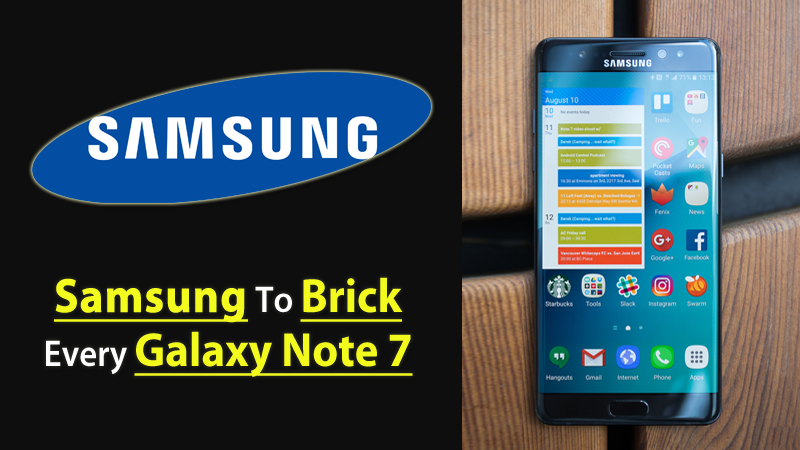 As the South Korean giant Samsung has recently stated that soon it will release a software update through which it will simply disable or brick all the active Galaxy Note 7. Anyone who has not yet returned their device should immediately power it down and contact their carrier to obtain a refund or exchange, or visit our website at Samsung.com/us/note7recall for more information”. However, Verizon is refusing to pass on the update to Note 7’s on its network. And the further statement is here. “Verizon will not be taking part in this update because of the added risk this could pose to Galaxy Note 7 users that do not have another device to switch to. We will not push a software upgrade that will eliminate the ability for the Note 7 to work as a mobile device in the heart of the holiday travel season. We do not want to make it impossible to contact family, first responders or medical professionals in an emergency situation”.